Snyder's Soapbox – Page 2 – Bible and Christian book reviews, along with original articles. The Hopelessness of Daily Work, Outside of Christ. Our sinful attitudes towards God’s judgment. Have you been waking up still exhausted, and forcing yourself forward through the drudgery of your morning, and work day? Do you feel despair, hopelessness, and futility? Have you ever thought to yourself, while at the brink of tears, “I can’t do this anymore. I can’t keep going to that place, it is killing me a bit each time I go.” Are the only things that keep you going, the thoughts of your obligations to your family, some moral code you learned as a kid, or a, “someday I’ll retire.” Kind of attitude? You’re not alone. All of us have been there, are there, or will be there in the future. It is not uncommon to mankind for us to feel this way, and have these thoughts. I’m not making excuses for them, just explaining that it happens. This punishment that God righteously, and justly applied to Adam, also applied to all his progeny. All mankind is under a curse due to sin, but there is hope in the second Adam, Jesus Christ. “15 But the free gift is not like the transgression. For if by the transgression of the one the many died, much more did the grace of God and the gift by the grace of the one Man, Jesus Christ, abound to the many. 16 The gift is not like that which came through the one who sinned; for on the one hand the judgment arose from one transgression resulting in condemnation, but on the other hand the free gift arose from many transgressions resulting in justification. 17 For if by the transgression of the one, death reigned through the one, much more those who receive the abundance of grace and of the gift of righteousness will reign in life through the One, Jesus Christ. 9 Nicodemus said to Him, “How can these things be?” 10 Jesus answered and said to him, “Are you the teacher of Israel and do not understand these things? 11 Truly, truly, I say to you, we speak of what we know and testify of what we have seen, and you do not accept our testimony. 12 If I told you earthly things and you do not believe, how will you believe if I tell you heavenly things? 13 No one has ascended into heaven, but He who descended from heaven: the Son of Man. 14 As Moses lifted up the serpent in the wilderness, even so must the Son of Man be lifted up; 15 so that whoever believes will in Him have eternal life. 3 Blessed be the God and Father of our Lord Jesus Christ, who according to His great mercy has caused us to be born again to a living hope through the resurrection of Jesus Christ from the dead, 4 to obtain an inheritance which is imperishable and undefiled and will not fade away, reserved in heaven for you, 5 who are protected by the power of God through faith for a salvation ready to be revealed in the last time. 6 In this you greatly rejoice, even though now for a little while, if necessary, you have been distressed by various trials, 7 so that the proof of your faith, being more precious than gold which is perishable, even though tested by fire, may be found to result in praise and glory and honor at the revelation of Jesus Christ; 8 and though you have not seen Him, you love Him, and though you do not see Him now, but believe in Him, you greatly rejoice with joy inexpressible and full of glory, 9 obtaining as the outcome of your faith the salvation of your souls. 10 As to this salvation, the prophets who prophesied of the grace that would come to you made careful searches and inquiries, 11 seeking to know what person or time the Spirit of Christ within them was indicating as He predicted the sufferings of Christ and the glories to follow. 12 It was revealed to them that they were not serving themselves, but you, in these things which now have been announced to you through those who preached the gospel to you by the Holy Spirit sent from heaven—things into which angels long to look. 17 If you address as Father the One who impartially judges according to each one’s work, conduct yourselves in fear during the time of your stay on earth; 18 knowing that you were not redeemed with perishable things like silver or gold from your futile way of life inherited from your forefathers, 19 but with precious blood, as of a lamb unblemished and spotless, the blood of Christ. 20 For He was foreknown before the foundation of the world, but has appeared in these last times for the sake of you 21 who through Him are believers in God, who raised Him from the dead and gave Him glory, so that your faith and hope are in God. Due to sin, we will survive by toiling, and in that toil is inherent suffering. Daily survival for mankind, whether you are in a technologically advanced society, or one where finding clean water is a daily challenge, will not be easy, pleasant, or comfortable all of the time. If it isn’t the physical struggles to survive against an untamed environment, the elements, and wildlife, it is the often mind crushing struggle against the busy, disconnected, overthought, modern lifestyle. We have subdued parts of the Earth, and brought things that make modern life easier physically. We have sewer systems, agriculture, housing with heating and cooling, clean water, schools, hospitals, light by night, and so on. These advances make life easier physically, but our physical struggles are replaced with new ones. It is impossible to escape the curse of the fall, but we are commanded to strive against human suffering, and the challenges of living. It is easy for us, looking back, to see Adam’s sin, but do we see our own? Can we see how our pride in possessions has caused us to forsake God for idols? Can we see how our family can become an idol? Can we see how our intellectual musings can be idolatrous? In our hubris, and pride at what we have done in conquering the Earth, we miss that we have left God behind, and become the gods of our own small castles of sin and rebellion. What can be done? How can we be content in this life? There is hope for our sinful responses to God’s justice. That hope is in Christ. If we have been regenerated by the Holy Spirit, repented of our sins, and trusted in the perfect atoning work of Christ, we will no longer be subjects of the flesh, and the sin that is in it. 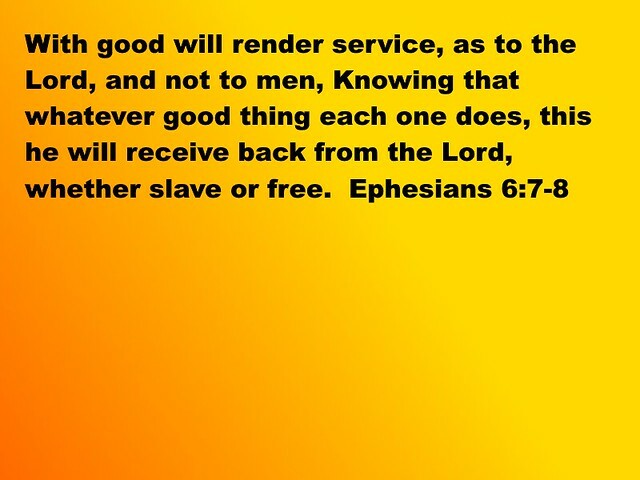 We will become servants, slaves of Jesus. He has given us the power to subject the flesh to righteousness, for the glory of God. “1 Therefore if you have been raised up with Christ, keep seeking the things above, where Christ is, seated at the right hand of God. 2 Set your mind on the things above, not on the things that are on earth. 3 For you have died and your life is hidden with Christ in God. 4 When Christ, who is our life, is revealed, then you also will be revealed with Him in glory. 18 Wives, be subject to your husbands, as is fitting in the Lord. 19 Husbands, love your wives and do not be embittered against them. 20 Children, be obedient to your parents in all things, for this is well-pleasing to the Lord. 21 Fathers, do not exasperate your children, so that they will not lose heart. “1 For I do not want you to be unaware, brethren, that our fathers were all under the cloud and all passed through the sea; 2 and all were baptized into Moses in the cloud and in the sea; 3 and all ate the same spiritual food; 4 and all drank the same spiritual drink, for they were drinking from a spiritual rock which followed them; and the rock was Christ. 5 Nevertheless, with most of them God was not well-pleased; for they were laid low in the wilderness. 6 Now these things happened as examples for us, so that we would not crave evil things as they also craved. 7 Do not be idolaters, as some of them were; as it is written, “THE PEOPLE SAT DOWN TO EAT AND DRINK, AND STOOD UP TO PLAY.” 8 Nor let us act immorally, as some of them did, and twenty-three thousand fell in one day. 9 Nor let us try the Lord, as some of them did, and were destroyed by the serpents. 10 Nor grumble, as some of them did, and were destroyed by the destroyer. 11 Now these things happened to them as an example, and they were written for our instruction, upon whom the ends of the ages have come. 12 Therefore let him who thinks he stands take heed that he does not fall. 13 No temptation has overtaken you but such as is common to man; and God is faithful, who will not allow you to be tempted beyond what you are able, but with the temptation will provide the way of escape also, so that you will be able to endure it. 14 Therefore, my beloved, flee from idolatry. 15 I speak as to wise men; you judge what I say. 16 Is not the cup of blessing which we bless a sharing in the blood of Christ? Is not the bread which we break a sharing in the body of Christ? 17 Since there is one bread, we who are many are one body; for we all partake of the one bread. 18 Look at the nation Israel; are not those who eat the sacrifices sharers in the altar? 19 What do I mean then? That a thing sacrificed to idols is anything, or that an idol is anything? 20 No, but I say that the things which the Gentiles sacrifice, they sacrifice to demons and not to God; and I do not want you to become sharers in demons. 21 You cannot drink the cup of the Lord and the cup of demons; you cannot partake of the table of the Lord and the table of demons. 22 Or do we provoke the Lord to jealousy? We are not stronger than He, are we? 23 All things are lawful, but not all things are profitable. All things are lawful, but not all things edify. 24 Let no one seek his own good, but that of his neighbor. 25 Eat anything that is sold in the meat market without asking questions for conscience’ sake; 26 FOR THE EARTH IS THE LORD’S, AND ALL IT CONTAINS. 27 If one of the unbelievers invites you and you want to go, eat anything that is set before you without asking questions for conscience’ sake. 28 But if anyone says to you, “This is meat sacrificed to idols,” do not eat it, for the sake of the one who informed you, and for conscience’ sake; 29 I mean not your own conscience, but the other man’s; for why is my freedom judged by another’s conscience? 30 If I partake with thankfulness, why am I slandered concerning that for which I give thanks? We only know work to be toil, but one day in eternity with Christ our labor will be joyful. We will do His will only, and not sin. Sinful temptations will be gone. Groaning under the curse of toil will be over. For those who are in Christ, we will be with Christ forever. What we do here, we must do to our best ability, and with the motive of bringing glory to God, the one who made us, and who saves us. We must labor for our own sustenance, and provide for our neighbors deficiency. Not because government mandates it. That would be unjust, but rather out of the new heart. With this in mind let us subject the unredeemed fleshly complaints, to what we know about God, and our hope in eternity with Christ. Let us live as though we are already there, loving, forgiving, and working, all for the glory of God. A Review of the E.S.V. 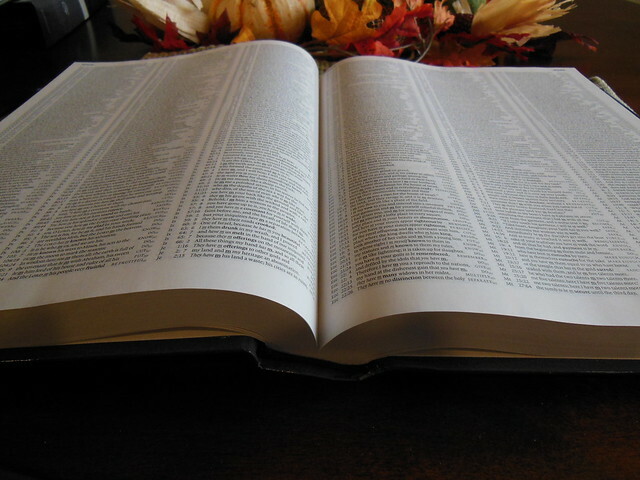 Exhaustive Concordance of the Bible from Crossway. Crossway, for a long time now has been manufacturing terrific quality premium, and value Bibles, as well as helpful Christian books. Oft overlooked are the study resources they publish. 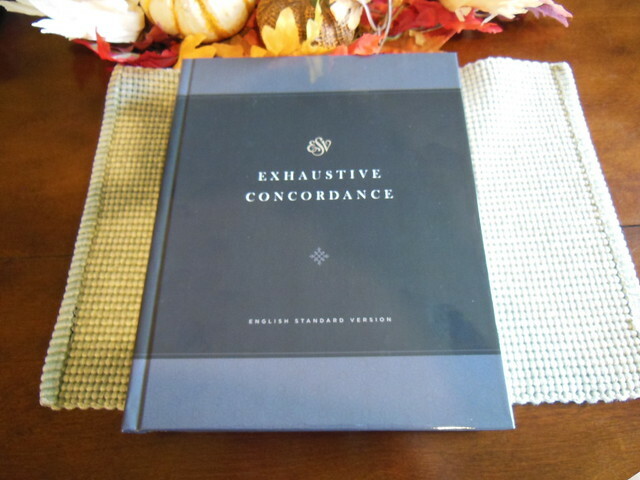 Today we are going to look at the, ” ESV Exhaustive Concordance.” If you’ve been a Christian for a while you probably already know what a valuable aid a good concordance can prove to be. If you don’t know what one is, let me tell you. A concordance has every word in the Bible, no matter how small it is, listed in alphabetical order, along with every occurrence of that word, and where in the Bible it occurred. 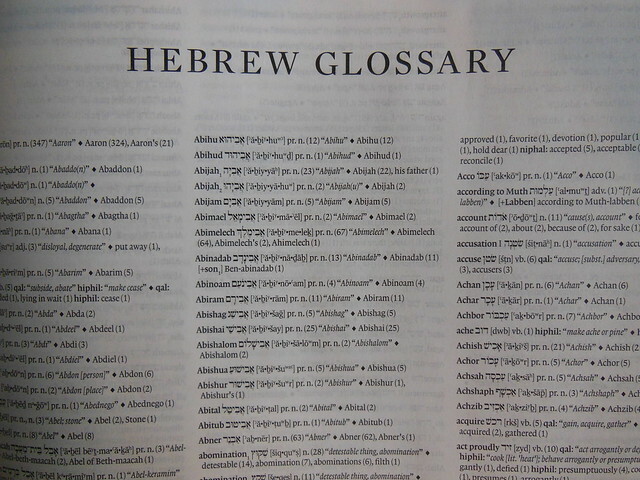 This one goes a bit further and includes Hebrew, Aramaic, and Greek glossaries, with entries for those words in the original languages. 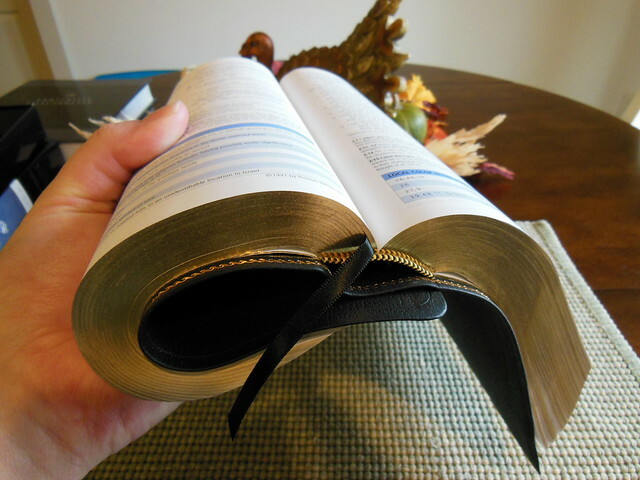 There is also a list of the words followed by their scripture references only, so you can find every occurrence quickly. If you aren’t quite sure what to do with a concordance here are a few suggestions; Do a word study. 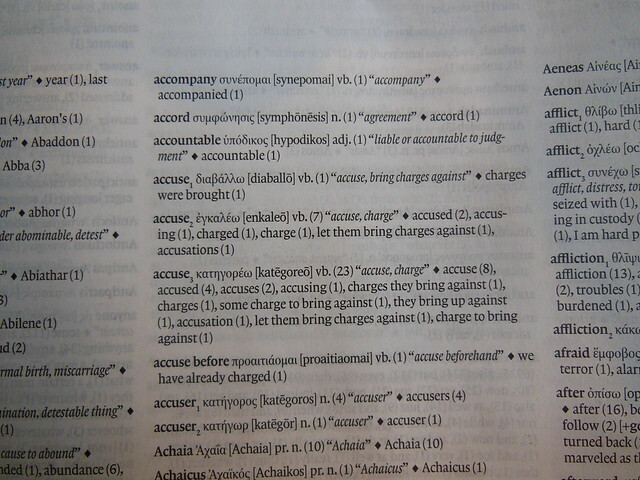 Check to see if the English word being used is translated from one or more different Greek words. Verify the veracity of someone’s claim. Trust me, once you start using a full concordance instead of the very abridged on at the back of some Bibles, you never want to be without one. This concordance is well made for many years of use. It is a hardback edition. 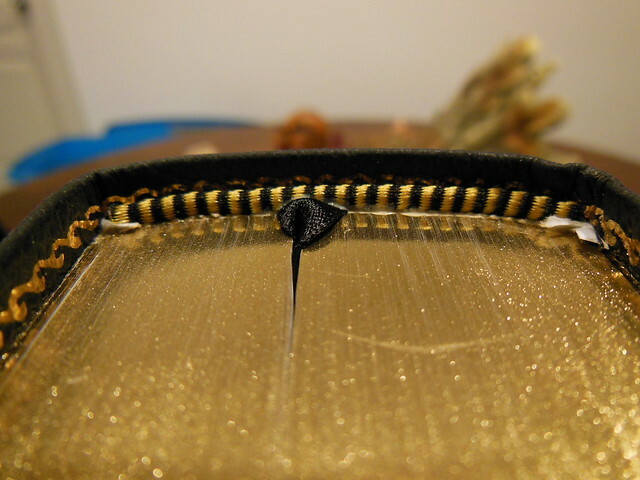 The spine is sewn, and rounded for easy use, and durability. There are black head and tail bands. The paper is 36 g.s.m. and opaque. I think it was about as thin as they could go without sacrificing legibility, considering the 6.5 Lexicon font. It strikes the perfect balance for a book of this size. The paper is white, and the type is clearly, and uniformly printed. Concordances, as you can imagine are not small books. This one is a hair thinner than my Strong’s. In the front of this concordance in the introduction you’ll find helpful diagrams of how to use this tome properly, as well as a Preface by Drayton Brenner who compiled it. You should always have a hard copy of your most important books. Electronic copies, and apps, are nice, and convenient, but they can be changed in one update overnight. Some apps make it difficult to browse to the information you want. Sometimes, it is just easier to look it up in a book. To that end, I encourage you to go out and pick up this concordance for your ESV Bible. You can purchase it on Amazon, Christianbook, or Crossway’s page. To see more pictures of this concordance please see my flickr album. This is an article I was sent. It is about anti-Christian bias in the music industry. The views in the article may not reflect the views of Snyder’s Soapbox, then again they may. Who knows? It is a mystery lol. Can we repent after we die? No. I don’t want to give anyone false hope. It is more damaging than the truth. I have had to work through this problem as well. Many of my family, and ancestors died as Roman Catholics, and are now condemned. They will experience the wrath of the holy, and just God for all eternity. This should be, and is a sobering notion. It should spur us on to boldly share the true good news with all of the lost people God brings into our lives. The elect of God will hear the gospel, repent, and believe, in this life. There is no doubt of that. God does not try to save someone and fail. The lost who die outside of the true Christ, will not be in Heaven. They will not have an opportunity to repent once they are dead. Even if they did, they would not truly repent. They would only be sorrowful over their condition much as the rich man was when he begged Lazarus for water, and instead of asking to be forgiven of his sinful life, he wanted his brothers to be warned. There is no way out of hell. Here are the sections of scripture that people usually use to support, what I, and approximately 2000 years of orthodoxy, consider the aberrant view of those who are dead repenting in Hell. Please note these verses are presented out of context by the proponents of the heterodox view. Now I will present what I believe is the Biblical position on the topic. God extends every opportunity to those outside of Christ to repent of their sins. Every moment of every day is another chance. All the way until their death, when it is too late. First we have to understand that people who are in their sins, and are not elect. They don’t care about God one way or another, or they are outright hateful of Him. People who are in works righteousness religions are gods unto themselves. They trust in their own righteousness as earned in their particular system. The notion of being a wretched worm of a sinner so bad that he could never merit favor with God is reprehensible to them, because they don’t think they are bad people. They might see themselves in relation to other people as flawed perhaps, or an occasional sinner, but they don’t see how they look in God’s judgment. Someone who dies a lost sinner also has the testimony of the natural revelation against them. If their conscious telling them they are sinners, isn’t enough, and the testimony of creation isn’t enough, and the prophets, and the Bible aren’t enough to convince someone neither will the incarnation of God. People who lived during the time of Christ, who met Him, and listened to His teachings wanted Him dead. Those who are not among the elect will hate God even more in Hell, they will only be sorry for their state, but not for their crimes against God because they have never been born again. Their sinful nature is no longer restrained by the Holy Spirit from being as evil as it could be. Common grace is over at that point. The thieves being crucified with Christ are a good example of this. One believed, and was promised by Christ to be with Him that day in paradise. The other had no promise, and did not repent, and mocked Christ as they all died. God has ordained only one way for people to be justified to Him, and that is the good news of Jesus. A person goes to hell, not solely because they had never heard of Jesus, or His good news, but rather because they are sinners. All people born after Adam, are said to be in Adam. They are all born under the curse, and have a sin nature. We don’t become sinners by sinning, we sin because it is our nature. We all deserve death and hell. The good news is that God being rich in mercy saves some. Most will be in hell. Matthew 7:13-14 (NASB Strong’s) “Enter through the narrow gate; for the gate is wide and the way is broad that leads to destruction, and there are many who enter through it. For the gate is small and the way is narrow that leads to life, and there are few who find it. Romans 5:12-14 (NASB Strong’s) Therefore, just as through one man sin entered into the world, and death through sin, and so death spread to all men, because all sinned— for until the Law sin was in the world, but sin is not imputed when there is no law. Nevertheless death reigned from Adam until Moses, even over those who had not sinned in the likeness of the offense of Adam, who is a type of Him who was to come. 1 Corinthians 15:20-22 (NASB Strong’s) But now Christ has been raised from the dead, the first fruits of those who are asleep. For since by a man came death, by a man also came the resurrection of the dead. For as in Adam all die, so also in Christ all will be made alive. Let’s break down the scripture that people erroneously use to support the notion that God will give the dead an opportunity to repent. To do that we must read it in context, so I will be citing the entire chapters. BUT THE FACE OF THE LORD IS AGAINST THOSE WHO DO EVIL.” 13Who is there to harm you if you prove zealous for what is good? 14But even if you should suffer for the sake of righteousness, you are blessed. AND DO NOT FEAR THEIR INTIMIDATION, AND DO NOT BE TROUBLED, 15but sanctify Christ as Lord in your hearts, always being ready to make a defense to everyone who asks you to give an account for the hope that is in you, yet with gentleness and reverence; 16and keep a good conscience so that in the thing in which you are slandered, those who revile your good behavior in Christ will be put to shame. 17For it is better, if God should will it so, that you suffer for doing what is right rather than for doing what is wrong. 18For Christ also died for sins once for all, the just for the unjust, so that He might bring us to God, having been put to death in the flesh, but made alive in the spirit; 19in which also He went and made proclamation to the spirits now in prison, 20who once were disobedient, when the patience of God kept waiting in the days of Noah, during the construction of the ark, in which a few, that is, eight persons, were brought safely through the water.21Corresponding to that, baptism now saves you—not the removal of dirt from the flesh, but an appeal to God for a good conscience—through the resurrection of Jesus Christ, 22who is at the right hand of God, having gone into heaven, after angels and authorities and powers had been subjected to Him. 1Therefore, since Christ has suffered in the flesh, arm yourselves also with the same purpose, because he who has suffered in the flesh has ceased from sin, 2so as to live the rest of the time in the flesh no longer for the lusts of men, but for the will of God. 3For the time already past is sufficient for you to have carried out the desire of the Gentiles, having pursued a course of sensuality, lusts, drunkenness, carousing, drinking parties and abominable idolatries. 4In all this, they are surprised that you do not run with them into the same excesses of dissipation, and they malign you; 5but they will give account to Him who is ready to judge the living and the dead. 6For the gospel has for this purpose been preached even to those who are dead, that though they are judged in the flesh as men, they may live in the spirit according to the will of God. 7The end of all things is near; therefore, be of sound judgment and sober spirit for the purpose of prayer. 8Above all, keep fervent in your love for one another, because love covers a multitude of sins. 9Be hospitable to one another without complaint. 10As each one has received a special gift, employ it in serving one another as good stewards of the manifold grace of God. 11Whoever speaks, is to do so as one who is speaking the utterances of God; whoever serves is to do so as one who is serving by the strength which God supplies; so that in all things God may be glorified through Jesus Christ, to whom belongs the glory and dominion forever and ever. Amen. The first 12 verses are obviously about Christian praxia in holy living. Then in next few verses Peter is exhorting the Christians to persevere in holiness, in Christ, during slander and suffering for righteousness sake, and to be prepared to practice apologetics. That entails knowing God through His word, and what you believe, so that you can relay it to others. In v. 18 when Peter says that Christ died once and for all, he wasn’t saying that He died to expiate the sins of all people, he was saying that He accomplished the penal substitutionary atonement, and there is no more to do. This is in stark contrast to the sacrificial system of the Jews in the Old Testament. By His violent death on the cross, the flesh was put to death. He was dead for three days. Christ’s spirit (deity) was alive, not the Holy Spirit, but by His own inner life as God. In v. 19 Christ in His spirit proclaimed to the demonic forces that were imprisoned in chains since the time of Noah His victory over them. These fallen were the ones that were most rebellious and evil, and needed to be restrained for the sake of mankind, and God’s plan of redemption. Lesser demons still remained on the Earth. The word prison in Greek is, “φυλακή” (phulake) which is more at prison, or under guard, but in no way is it, “ᾍδης” (Hades) the realm of the dead or the grave. In v. 20 you see the direct statement that these were the rebellious demons that caused so much evil during the time of Noah. The demons were so evil convincing mankind to engage in all manners of sin, that none of them would listen to the preaching of Noah, and repent. God only saved Noah, and his family by bringing them through the flood in the ark. In v. 21 some people may get confused and think that baptism justifies you to God, but it does not. All you need to do to know that it is actually by the work of Christ is to read the entire verse. The baptism is a symbolic appeal to the God by the atoning work of Christ and His resurrection. In v. 22 Peter is demonstrating Christ’s triumph over the demonic by pointing our His ascension, and how everything has been placed under His authority. This section of scripture doesn’t end with Chapter 3. You can tell by the first word of v. 1 of Chapter 4, “Therefor” and as always you must as what is it, “there for?” As Christ suffered on the cross and was victorious, we should be willing to suffer for our faith, and doing what is right, with the knowledge that we will be with Christ for eternity. There is an exhortation to not behave like they did before they were saved. 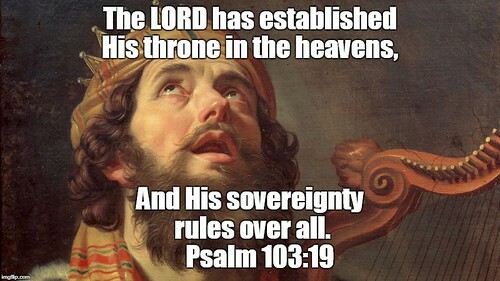 Have you read Psalm 103 lately? Psalms 103:1-2 (NASB Strong’s) Praise for the Lord’s Mercies. As David exhorts his soul to bless the Lord, we have to ask ourselves what it means to bless God. When we think of blessing a person often ideas of gifts or deeds to benefit them come to mind. What can one give to God, the Creator of all things, who knows all things perfectly? The error with that notion is that God is a man to be blessed as a man, but He is not as we all know. To bless the Lord means to speak well of Him. To extol His attributes. We can see in the following verses that is exactly what David does. He also exhorts the angels and all of creation to do so as well. In verses 3-5 the psalmist asks five rhetorical questions to motivate the hearer (his soul) to recognize the Lord God. The answer to all five questions is obviously God. God pardons his iniquities. God heals his diseases. God redeems his live from the pit. God crowns him with lovingkindness and compassion. God satisfies his years with good things so that his youth is renewed like the eagle. In verses 6-19 we see the psalmist bless the Lord. He lists ways God is in His attributes, and how He is towards man, His creation in light of those attributes. You see when God blesses us, it is for our benefit. He doesn’t speak well of us to bless us. He involves us in relation to Him. The closing verses not only exhorts the angels to bless God, but also all of creation, and is a restatement for conclusion of the exhortation at the beginning. We should likewise bless the Lord from the depths of who we are in Him. Let us speak well of God in reverential awe of who He is, what He has done, and what He continues to do in space-time, and eternity. 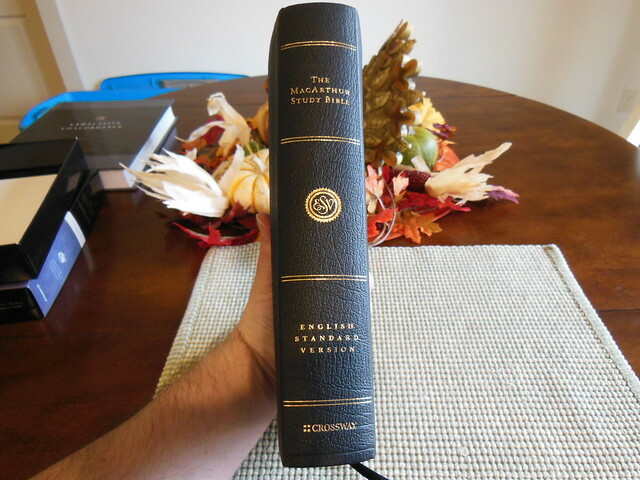 A Snyder’s Soapbox Review of the, “John MacArthur Study Bible in the E.S.V. Translation” with a Genuine black leather cover. I know this Bible has been out for quite some time, but Crossway was kind enough to send one out for review. This is one of their Bibles I have not reviewed yet, and perhaps you haven’t looked into it yet either. I have two other John MacArthur Study Bibles. One is from Thomas Nelson, and it is a N.A.S.B. The other is the 25th Anniversary Edition in N.K.J.V. The things that struck me between the three different editions are the qualities of the papers, the printing, the spine/binding, and the cover options. In all of the qualities, except one, the Crossway comes out on top, and not just by a little. The genuine leather cover is more like a genuine calfskin leather, and not at all like the pigskin leather that came on the Thomas Nelson made N.A.S.B. The quality of the 25th Anniversary N.K.J.V. leather cover was slightly better than the Crossway edition’s. The 25th Anniversary edition’s cover was a bit thicker, perimeter stitched,and had an inner liner which moire silk. 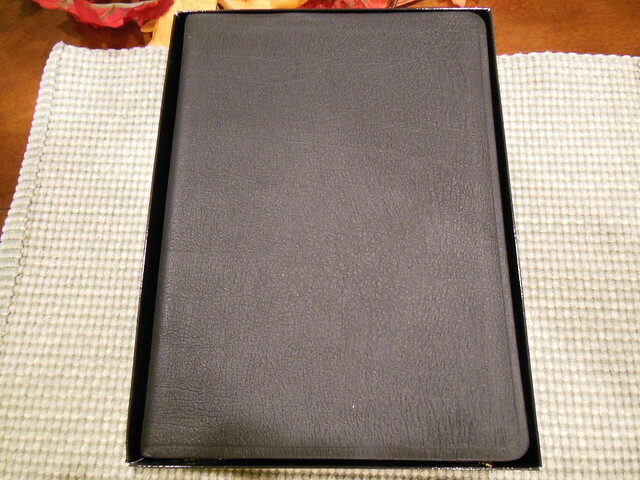 You would not expect a simple genuine leather edition to come anywhere near the quality of a premium Bible, but it does. The spine of the 25th anniversary edition has raised hubs, the other two do not. This is not a big deal. It is only decorative. The paper on the Crossway far exceeds the quality of the other two. The other two are less white, and have almost a newsprint color to them. They are also made of toothier paper. The Crossway is smooth, and white, but not too bright. It is just bright enough to offer the proper contrast between the uniformly, and sharply printed font. The spine of the N.A.S.B. from Thomas Nelson is not sewn, but glued. 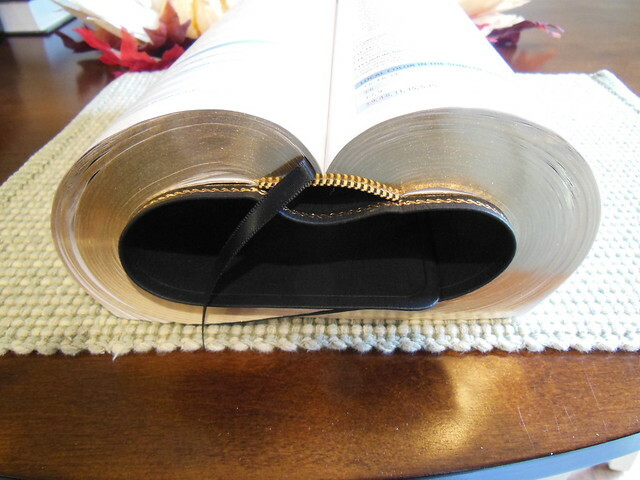 It is a case/perfect bound Bible. The Crossway, and the 25th Anniversary N.K.J.V. are both sewn. 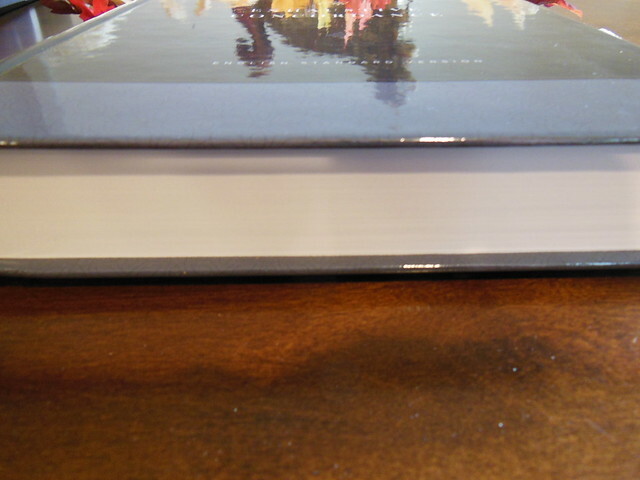 The Crossway is about the same thickness as the Thomas Nelson. Both are much thinner than the 25th Anniversary N.K.J.V. I’m not sure why it is so thick. I’m guessing it is due to the type of paper. They all have relatively the same amount of content. They could all use better ribbons. The Crossway has nicer maps, of course 🙂 If you are interested in it,hurry up and get it while it is on sale for Christmas! The Crossway, English Standard Version, in genuine black leather comes in a two piece retail box. 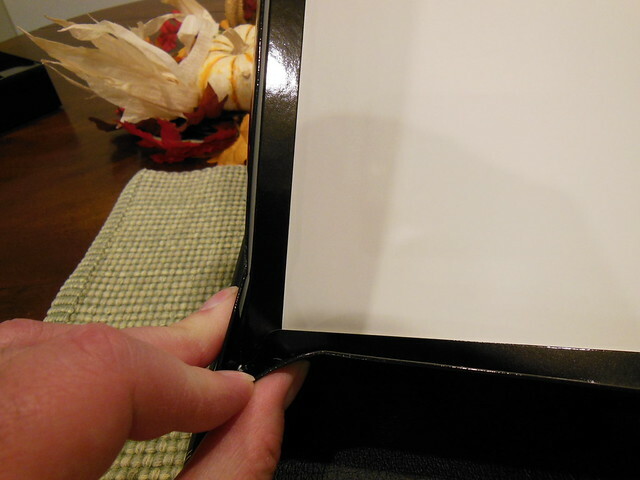 The box isn’t as sturdy as some other boxes, but I would still hold onto it to store your Bible in when not in use. The Bible itself is full of helpful features that will be of great value to you while you endeavor to learn more about the God who saves. You might have noticed there is a discrepancy between the two lists, one says the font is 8.7 pt. for the main text, and 7.6 pt. for the notes, the other list says it is 8, and 7 pt. When I contacted Crossway they confirmed that the font is 8.5 pt. for the main text, and 7.5 pt. for the notes. They also provided me with the font type, which is ITC Stone Serif. 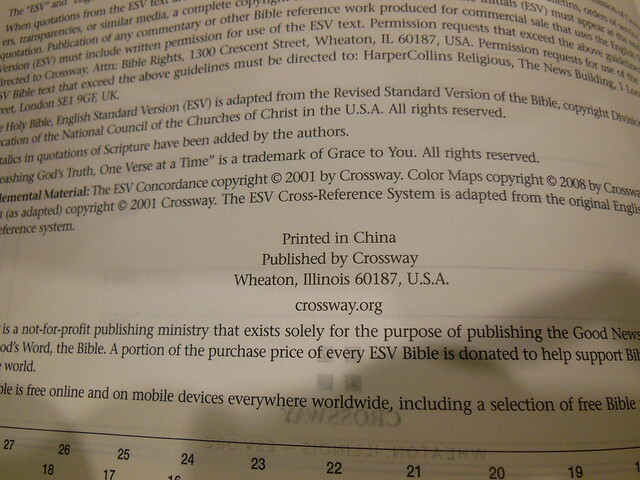 For people who are curious, this Bible is printed, and bound in China. I know, I know, Chinese made stuff is junk… Well Crossway has ensured that the quality is top notch. I’m not sure how they do it, but I would like to find out. Hopefully one day, I’ll get the chance. The cover has a nice grain to it, and a perimeter groove on the outside. The inside liner looks like your typical vinyl. 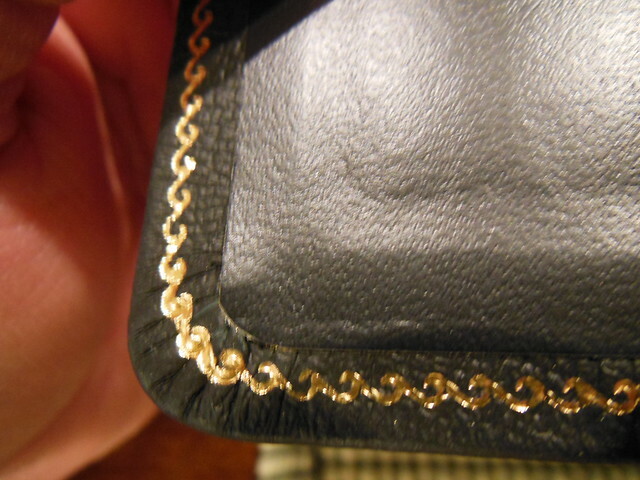 There is a nice gold perimeter ornamentation hot-stamped on the inside of the cover as well. 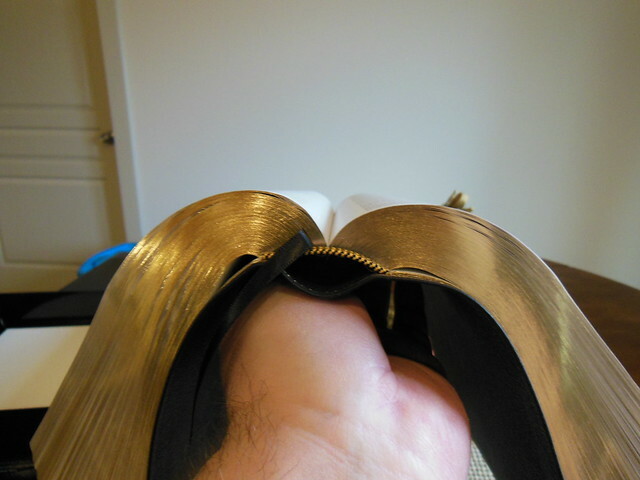 The page edges are gold guilt, and there are head and tail bands too. 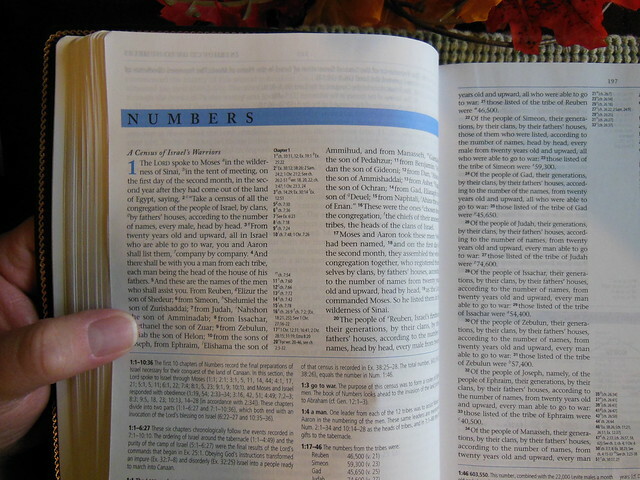 My biggest gripe about cheap Bibles is that they use glued spines, and all the pages fall out. They are also notoriously difficult to keep open, or get to lay flat. You won’t have that problem with a good sewn spine. 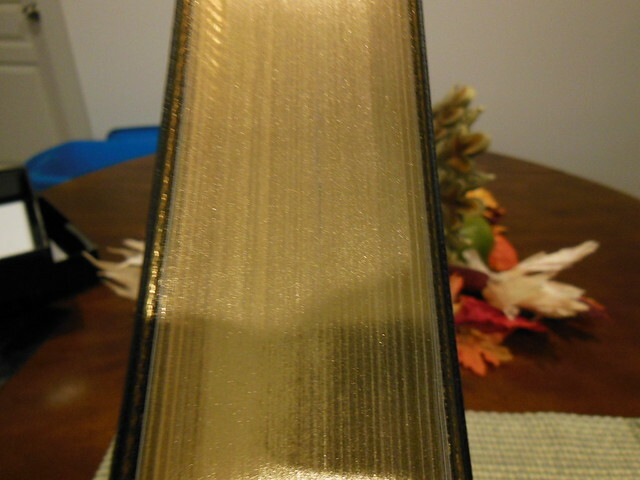 The Crossway MacArthur Study Bible has a nice sewn spine as you can tell from the following pictures. It also has one ribbon marker. I really like the simple style of the spine. 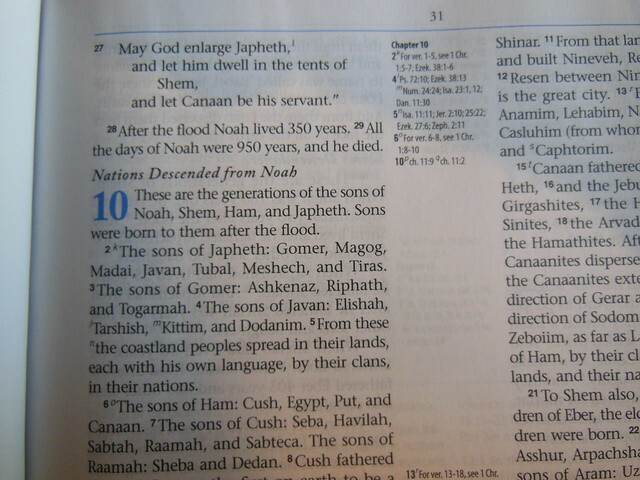 One of the things I like about this Bible is the use of the color blue for the chapter numbers and features. 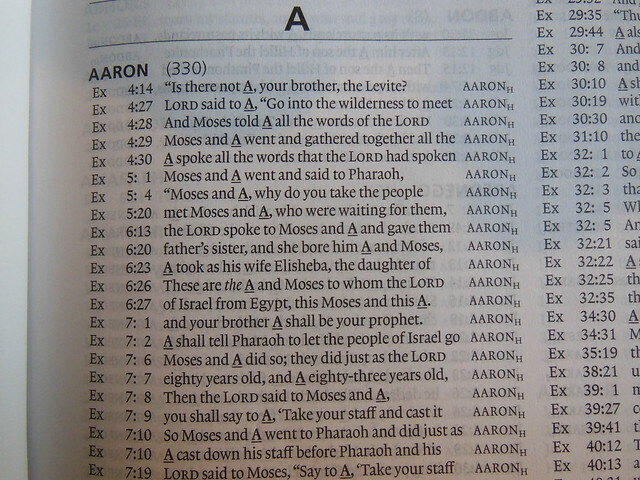 This is a black letter edition, with double column, paragraph layout. 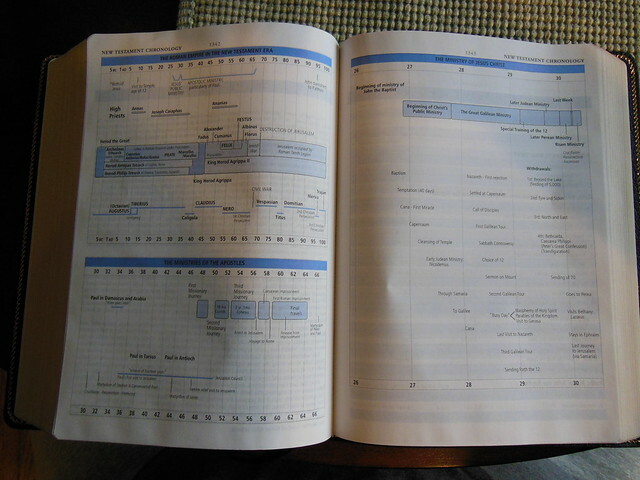 The cross references are in the center column, and the notes are on the bottom. 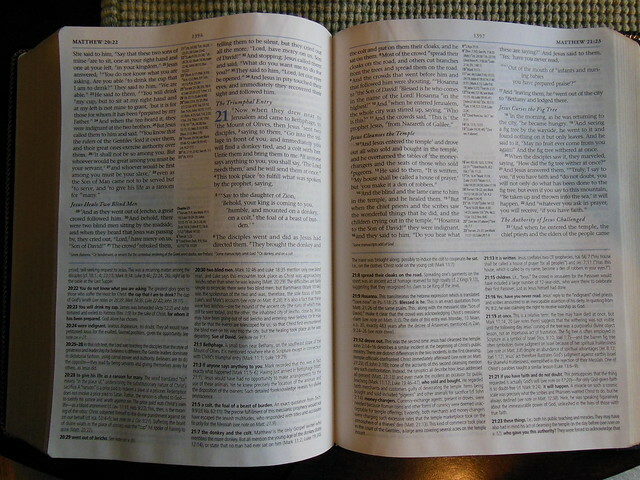 With the quality of paper, and printing this Bible is not hard on the eyes. 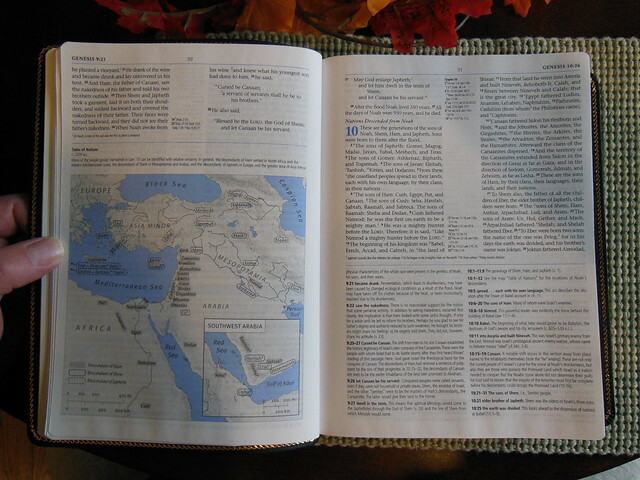 After looking over this Bible, and comparing it to other editions, I can give it a thumbs up. It is a great value, especially when it is on sale. You can get your copy from Christianbook, or Amazon. Make sure to check out all of the pictures of this Bible on the Flickr page. Here is an excerpt from A.W. Pink’s commentary on Exodus. This section is about how the materials of the tabernacle were typological representations of Christ. Historically, we may admire the fruit of God’s grace working in the hearts of His redeemed so that they willingly offered the required materials. Their offering was so spontaneous and full (see 35:21-29) that we are told, “And they spake unto Moses, saying, the people bring much more than enough for the service of the work, which the Lord commanded to make. And Moses gave commandment, and they caused it to be proclaimed throughout the camp, saying, Let neither man nor woman make any more work for the offering of the sanctuary, so the people were restrained from bringing. For the stuff they had was sufficient for all the work to make it, and too much” (36:5-7). But behind the historical we are to look for the spiritual, and behold here a lovely type of the voluntariness and joy of the Lord Jesus, who freely and gladly became flesh, thus providing God with a perfect Sanctuary as He tabernacled among men! “And this is the offering which ye shall take of them; gold, and silver and brass; and blue, and purple, and scarlet, and fine linen; and goats, and rams’ skins dyed red, and badgers skins; and shittim wood; oil for the light, spices for anointing oil, and for sweet incense; onyx stones, and stones to be set in the ephod, and in the breastplate” (v. 3-7). Each of these articles tells forth one of the manifold perfections of Christ. The gold, His Divine glory. The silver, the redemption which He wrought and bought for us. The brass, His capacity to endure the wrath of God against our sins. The blue, His heavenly origin. The purple, His royal majesty. The scarlet, His earthly glory in a coming day. The fine linen, His holiness made manifest by His righteous walk and ways. The goats’ hair, His atonement. The rams’ skins, His devotedness to God. The porpoise skins, His ability to protect His people. The shittim wood, His incorruptible humanity. The oil for the light, His Divine wisdom. The spices, His fragrance unto God. The precious stones, His priestly perfections. We do not now offer proofs for these definitions nor enlarge upon their blessedness, as, God willing, each one will come before us for fuller consideration in the articles to follow. With the above verses should be compared Exodus 38:24-31, where the Holy Spirit has given us the respective weights of the gold, silver and brass. Careful students have estimated there would be fully a ton and a quarter of gold, which at modern value would be worth upwards of one hundred and seventy-five thousand pounds, or eight hundred and sixty thousand dollars, but allowing for present day purchasing values, worth much more. Of silver there would be fully four tons and a quarter, and worth forty thousand pounds or two hundred thousand dollars. Of brass (more likely, copper) there was also over four tons. In addition, there were the textile fabrics, blue, purple, scarlet and fine twined linen, besides goats’ hair, rams’ and badgers’ skins, and large quantities of shittim wood, the amounts of which are not recorded. Last, but not least, were the precious stones for the breastplate of the high priest. All of this indicates the great costliness of the Tabernacle. At modern values its materials would be worth at least a million pounds or five million dollars. How this, in type, told of God’s estimate of Christ; how it shows us the Father saying, This is My Beloved Son in whom I am well pleased!